The Quest for Anna Klein by Thomas H. Cook, a Mysterious Review. Review: Thomas H. Cook's latest stand-alone, The Quest for Anna Klein, takes place in different locations and different time periods, both of which would seem to be very far apart and yet somehow not. Anna Klein is referred to early in the book as a chameleon, which turns out to be truer than you might like it or want it to be. I must admit after reading the book, I went back and read through the 2001 segments and then the 1939 ones, just to discover what I may have missed. I felt I needed a clearer picture of the main characters as well as their development with respect to location and time. The use of location, intertwined with the persistence of character, may cause readers to be ambivalent about how the story plays out. I, for one, wanted a different outcome. Still, the telling of this story never loses its substance or romance, and Cook uses the backdrop of espionage as a way of stimulating your curiosity so you stay interested. On my second read through I was able to enjoy more the descriptive prose of the author, and what a wonderful writer he is. His use of the narrator's, Thomas Jefferson Danforth's, social circumstance and storytelling ability made this a good book to read. 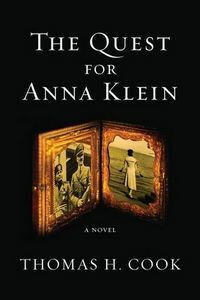 Special thanks to Lynne Gordon for contributing her review of The Quest for Anna Klein. Acknowledgment: Houghton Mifflin Harcourt provided an ARC of The Quest for Anna Klein for this review.